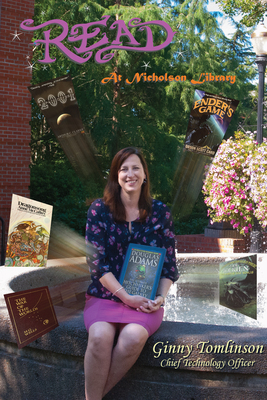 Ginny Tomlinson, Chief Technology Officer, reading The Ultimate Hitchhiker's Guide to the Galaxy, by Douglas Adams. Armstrong, Lige and Nicholson Library Staff, "Ginny Tomlinson READ Poster" (2015). READ Poster Gallery. Image. Submission 146.